Happy New Year - You, ozfortress, and 2018! On behalf of the entire administration team, I'd like to wish the ozfortress community a very happy new year. It's been a really great year, with the great Pyro Update and we are super excited about what we have planned just round the corner! We have the second night of A Midsummer Night's Cup 2018, and an action-packed OZF 21 right after that! Along with the flagship ozfortress seasonal league, there are smaller tournaments such as Ultiduo in the off-seasons. As for 2018, there's a few small things I want to address regarding our plans. I believe in transparency so it is best for me to notify you of what we wish to accomplish this year. There will be no major changes and all the items I am about to discuss are minor differences between 2017 and the planned 2018. This is also the first time that rough dates for all events of the year are publicly published in advance. Many members of our community have been concerned about the shorter off-seasons since the introduction of the tri-annual ozfortress seasonal league. In 2017, the entire calendar was based to have the longest off-season possible whilst accounting for exams for most major universities as well as the HSC/VCE/QCE. However, the majority of our users have voted as per the November Poll that it does not matter to them if ozfortress seasons run concurrent with exam periods. As a result of this, for 2018, there will be longer off-seasons at the expense of seasons running through some exams. As a side note, university Semester 1 exams are unavoidable regardless of what we do. Year 12 exams also suffer from this complication. The only set of exams that we can somewhat avoid are Semester 2 exams. We also wish to extend the period of signups for the ozfortress seasonal league. For the past two years, this period has been set at 11 days. We intend to extend this to sometime between 2 to 3 weeks. Ultiduo will again run after the first season of this year. We expect it to occur sometime mid-late April in the off-season. We also wish to run a small tournament (similar to the Summer Cups) around August of 2018. The format or type of tournament has not yet been decided. In development is an infraction system that existed with the old forums. We are in the late stages of developing these infractions and intend to implement them sometime in the first few months. The Global Whitelist will continue to be implemented and updated throughout this year. There have been some recent changes to the Whitelist as per the Pyro Update, with some weapons being tested in the current off-season. View these changes here. As with the forums, we wish to make several improvements to the new system on warzone before we migrate. We plan to close and archive the old site to preserve the history, and start fresh on warzone. There will be similar sub-forums and major threads on the new system. We thank /dev/zero for his continued development and many hours spent on maintaining and upgrading warzone. Thanks everyone for traveling with us throughout the year and being such a supportive community. We do this because we love it, and we hope you love the ride too <3. 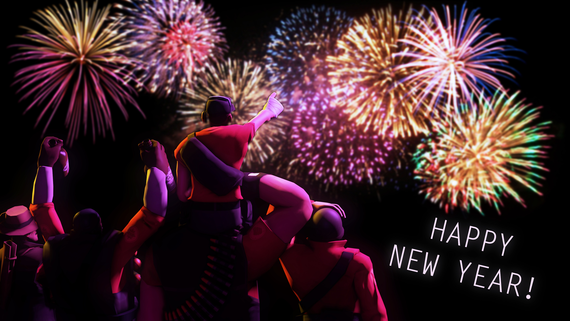 With that, have fun, stay safe, and see you all around for an incredible 2018.
Credit to Karhunperse for the image.